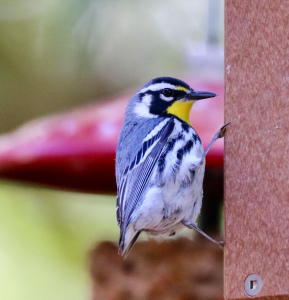 The Yellow-throated Warbler, Setophaga Dominica, is a common warbler in this area year round and breeds west to Texas and north as far as Illinois. They are part of the family of Wood Warblers or Parulidae. If you are lucky enough to spot this stunning warbler, it is an easy bird to identify. It has a bright yellow throat and chest with sharply contrasting black triangles through and below the eyes and bright white eyebrows. The back and top of head are gray with a white under-belly and two white wing bars. The Yellow-throated Warbler, besides having colorful markings, is also distinctive because of its stockier body and longer, sharp, black bill. The male and female are similar in appearance with the female being slightly duller. 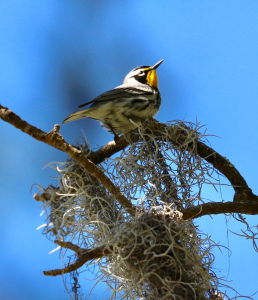 The Yellow-throated Warbler’s song is a clear series of down whistles with a rising note at the end as teeew-teeew-teeew-teeew-tew-tew-twi .The male will actually establish his territory during breeding season with his song. These warblers will most likely be spotted in this area by looking higher up in a pine, live oak, or palm tree. They actively forage by quickly creeping in and out along branches and spiraling up and down trunks of trees. They probe deliberately into crevices, pine needles, pine cones, and Spanish moss looking for insects. This bird will creep instead of fluttering as some warblers do. In palm trees they might be spotted in the crowns or hanging upside down among the leaves. The diet of the Yellow-throated Warbler is mostly insects. They are insectivores and feed on beetles, moths, caterpillars, grasshoppers, crickets, flies, mosquitoes, ants, aphids, and spiders. However, they will also come to your backyard feeders if you have the feeders in an area that is a desirable habitat for them and perhaps have a feed mix that includes fruit and/or dried mealworms. Once the male locates his territory and his mate, the male and female stay monogamous during the nesting season and produce two broods per year. The nest, prepared mostly by female, is either in a clump of Spanish moss or at the outer edge of a high pine branch. In the Spanish moss the female will form a pocket and line it with grasses, weeds, and feathers. On the pine branch, she will weave together weed stems, bark strips, and grasses to form a cup and then line it with plant down and feathers. She will lay three to five pale gray-green eggs with dark specks that are less than an inch long. Both the male and female incubates the eggs and feed the nestlings. The eggs incubates for 12 to 13 days and the young leave the nest in about eight days. The new family will stay together during the breeding season and then become part of a mixed species flock with Carolina Chickadees, Tufted Titmouses, and other warblers during non breeding season. Luckily for us, the Yellow-throated Warblers have increased their population by 50% between 1966 and 2014, according to Partners in Flight, and at this time are not a conservation concern. This entry was posted in SIB. Bookmark the permalink.